No one likes multi-megabyte attachments. 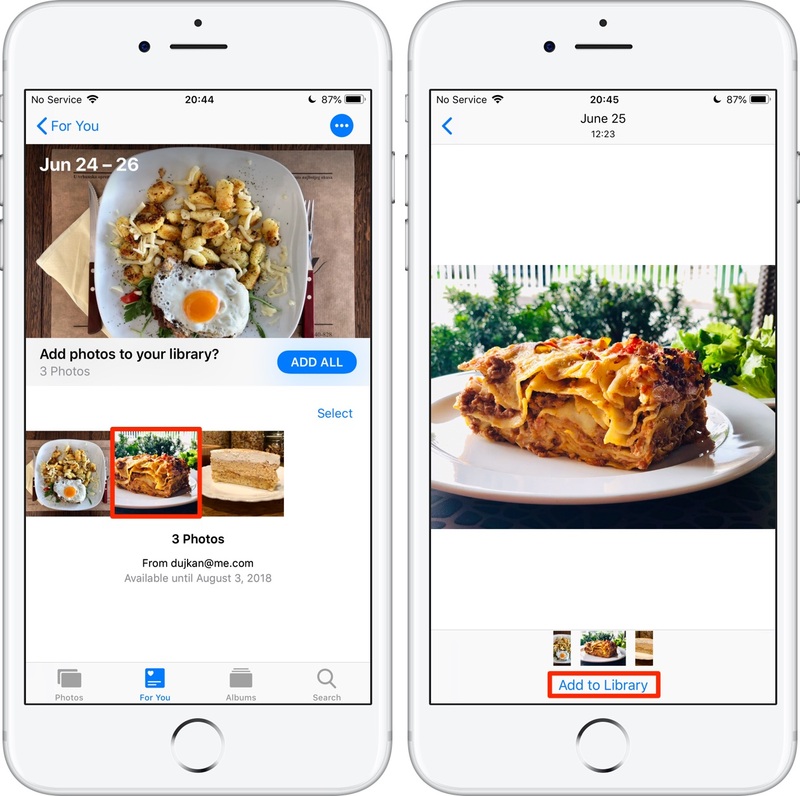 That’s why iOS 12 lets you quickly share iPhone photos and videos from your Photos library by generating Dropbox-style links that anyone can open to download the items. Why share links and not the actual files? Because sending full-resolution photos and videos via email or iMessage is last century and not particularly bandwidth-friendly. Photos for Mac currently lacks this link-generation feature. To see the stuff you shared, your recipient simply opens a sharing link. This should be especially useful when sharing multiple photos and videos with non-Apple devices. Your device uploads the shared items to iCloud, but these don’t count against your storage allotment quota. You’ll save your recipients a bunch of bandwidth if you share media this way because all you’re sending is a link. When tapped on iOS, the link opens in Photos. 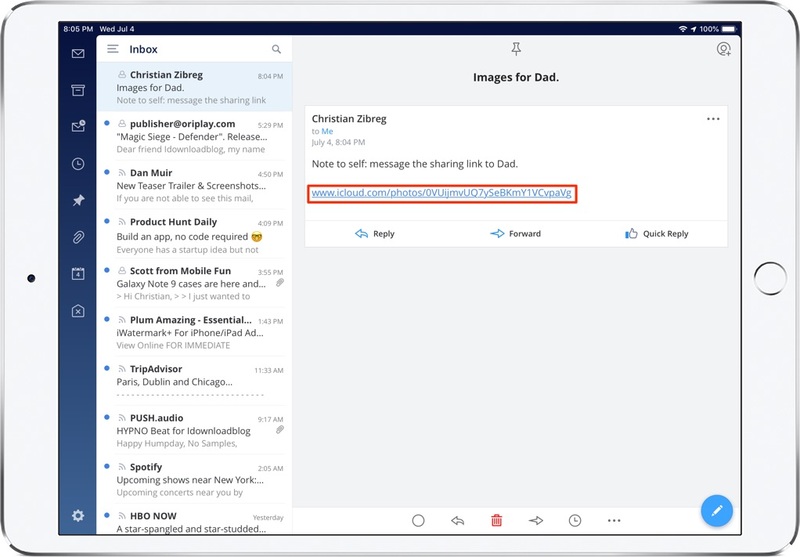 On desktop, clicking an iCloud sharing link received through Messages, email or other means opens a preview at iCloud.com. The shared link is accessible to anyone that has it, for up to a month before it expires. Any edits made to a shared item on your device will not reflect on the recipient(s) devices. What recipients see and download is a version of the image at the time of sharing. Folks you send media sharing links to don’t need to have iCloud Photos enabled on their end. 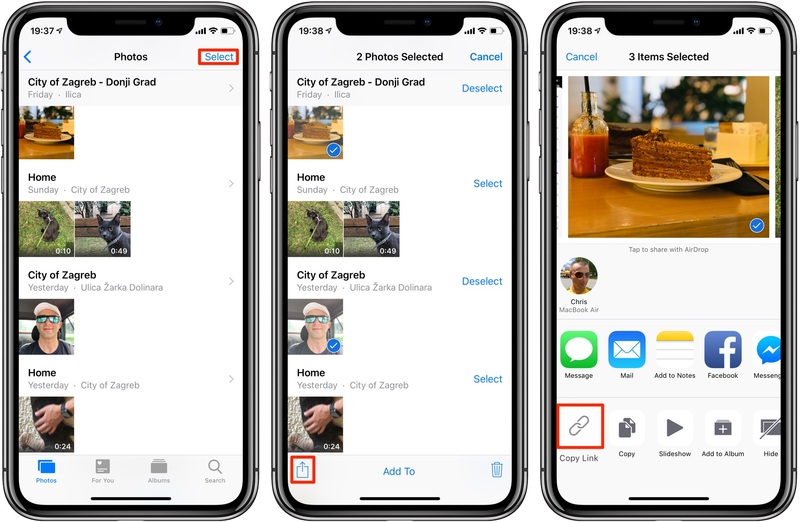 1) Open the Photos app on your iPhone or iPad with iOS 12 or newer. 2) Under the Photos tab, hit Select in the upper-right corner. 3) Pick one or more media items you’d like to send to someone. 4) Tap the Share button. 5) Choose Copy iCloud Link in the bottom row of icons. A message pops up to inform you that your photos and videos are being prepared for sharing, which may take a while depending on their size and number. 6) With a link copied to the system clipboard, use the Paste action to send it to friends or family using Messages, Mail or another app of your choosing. 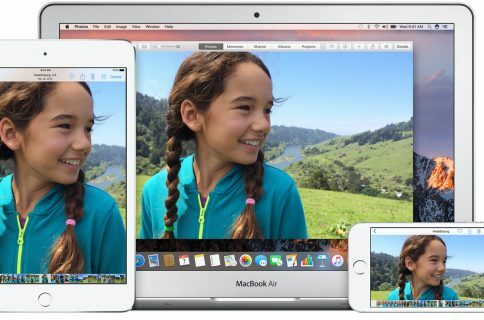 You can access shared iCloud photos and videos via a computer, iPhone or iPad. 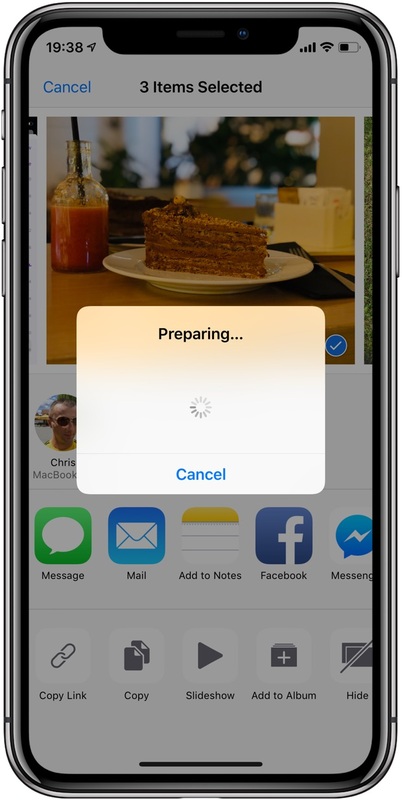 iOS customers are treated to the most frictionless sharing experience due to the deep integration with the Photos app. 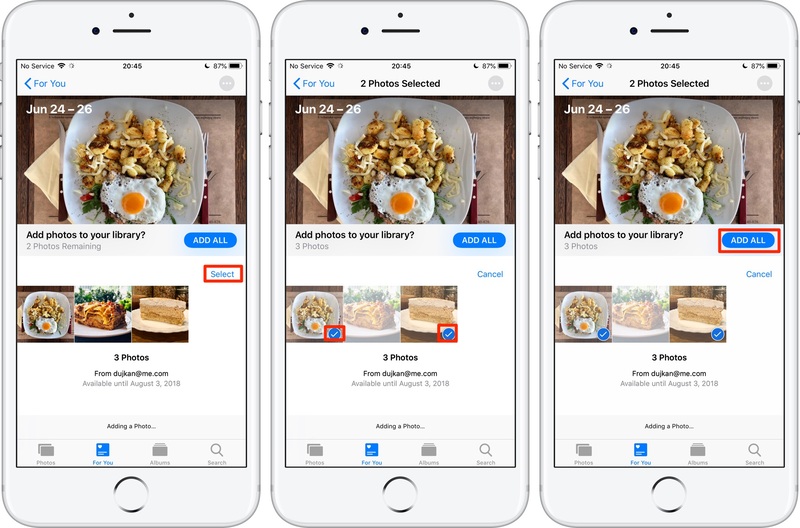 You don’t need to manually open a link, thanks to iOS 12’s enhanced Siri intelligence which detects it and automatically creates a preview in Photos. Don’t worry, nothing will be added to your image library unless you specifically choose so. Receiving a link in an email on iOS may create a preview page in Photos, too. Opening a link on non-iOS devices, like an Android smartphone or tablet, takes you to an underlying download page on iCloud.com. 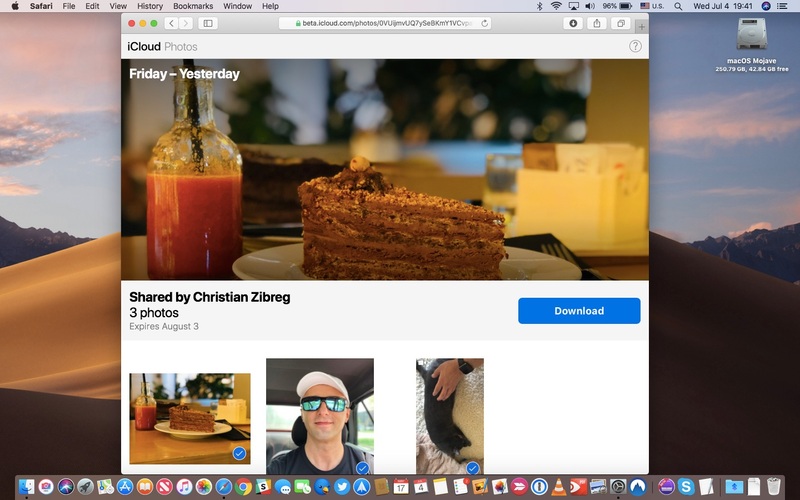 Accessing a link in your favorite desktop browser opens a nicely designed download page on iCloud.com with the same grid of thumbnails like the preview page in Photos. The media is shared with full EXIF data, including camera model and location. 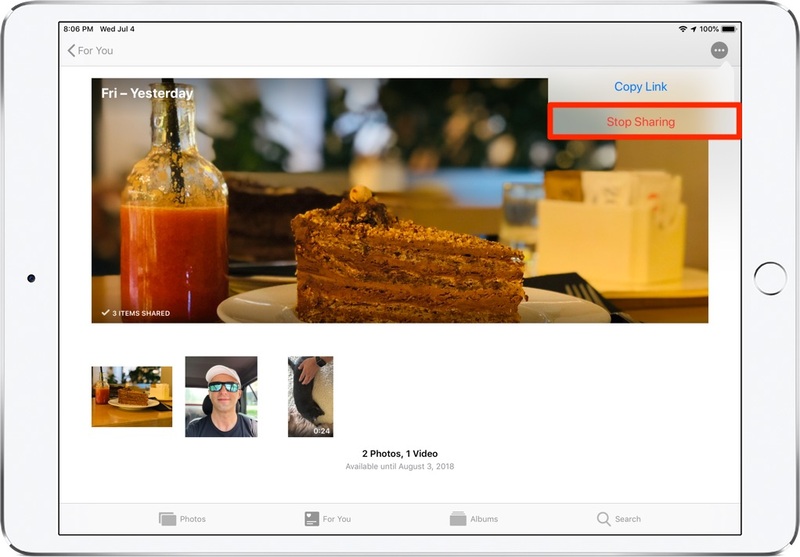 To retain the items before a link expires or the sender stops sharing, add them to your Photos library or download them to a computer through the web interface. Nothing gets added to the Photos library unless you specifically cherry-pick the shared photos and videos you’d like to keep. You can copy everything at once to Photos, choose multiple items to keep or add just a single image to the library. No matter what you choose to keep, a preview page remains present in Photos and on iCloud.com until sharing is revoked or the sharing link expires automatically 30 days after you created it. 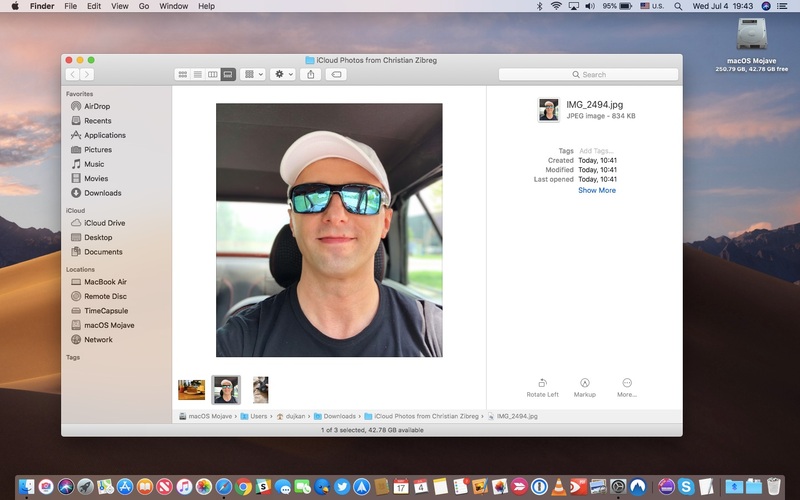 1) Open the Photos app on your iPhone or iPad with iOS 12 or later. 2) Tap the icon labeled For You in the tab area found alongside the bottom. 3) Tap a preview of the share underneath the Recently Shared headline. 4) Tap the Add All button. All of the shared media items get downloaded to your device in their original resolution. Find them in the Photos tab, positioned in accordance with their original creation date. Do the following if you’d like to quickly add a single shared item to your library. 2) Tap the icon For You in the tab area found alongside the bottom. 4) In the lower half of the interface, tap a thumbnail to see the underlying photo or video. 5) Tap the button Add to Library centered at the bottom of the interface. The current item is downloaded and saved to the Photos library on your device. 4) Tap Select near the top-right corner of the thumbnail section. 5) Tick the checkmark in the top-right corner of each photo or video you’d like to keep. 6) Tap the Add All button. The selected items will be download straight to the Photos library on your iOS device. You can download the shared media with any web browser for Mac or Windows. 1) Open a desktop browser of your choosing (we’ll use Safari). 2) Click the URL field at the top of the window, paste the iCloud.com link copied from a friend’s iMessage or email and hit Enter or Return on the keyboard. 3) You’ll see a simple webpage with a grid of thumbnails. Pick the items you’d like to keep by ticking the circle in their top-right corner, then hit the Download button. 4) Once the ZIP file has been downloaded to your computer, go to your default Downloads folder and double-click the archive to unpack it. 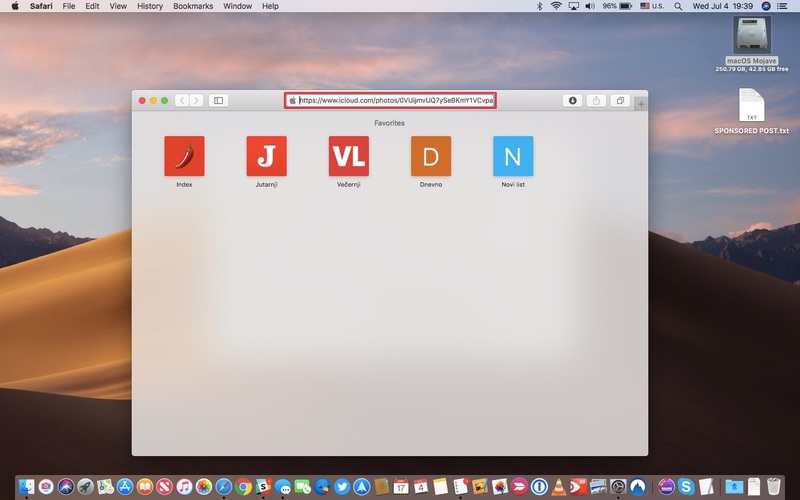 The web interface at iCloud.com allows anyone to access shared media via a browser, even if they’re not on one of Apple’s platforms, like Linux customers. iCloud Photos must be on before you are permitted to create a link. 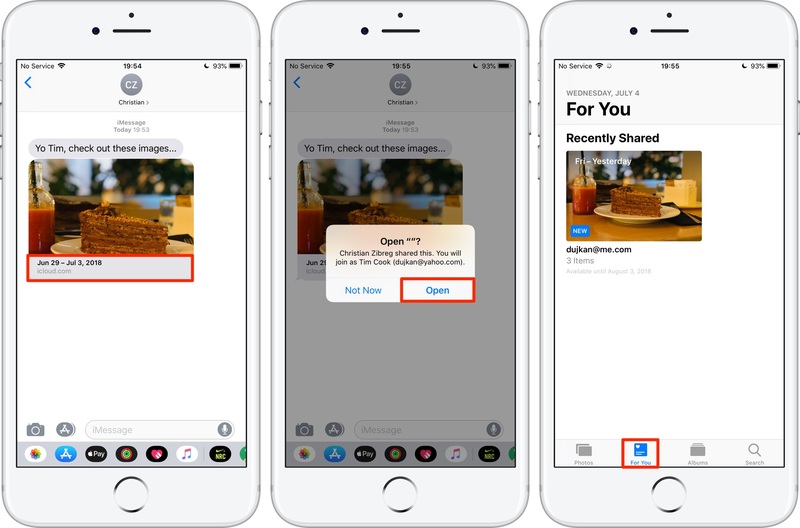 If you try to share media but iCloud Photos is off, you’ll see a message cautioning you that iOS 12’s new sharing suggestions and iCloud.com sharing links sharing require that iCloud Photos be toggled on in the sender’s Settings app. Tap the link Use iCloud Photos, then tap the button Use iCloud Photos to quickly enable this feature. Or, venture into Settings → your name → iCloud → Photos to set it up manually. 4) Choose Stop Sharing from the three-dotted menu in the top-right corner. 5) Confirm the operation by selecting Stop Sharing from the popup menu. 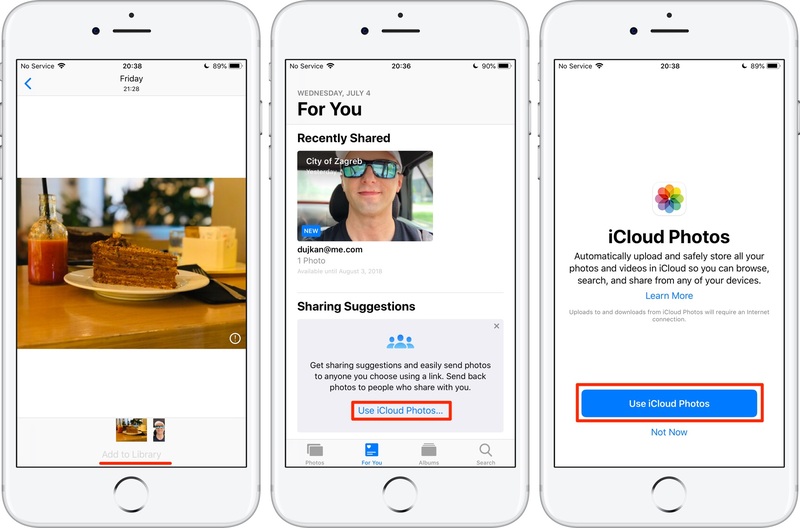 Access to your shared media will get removed from iCloud immediately. 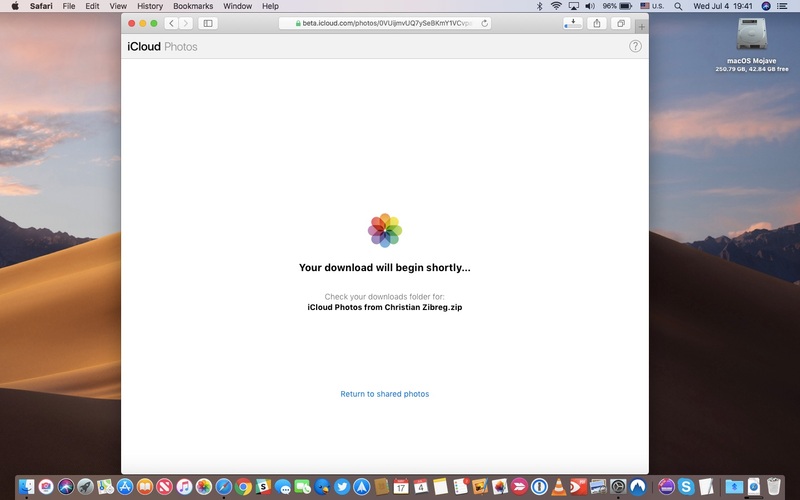 A preview of the shared items disappears from Photos for everyone and the associated iCloud.com download webpage is pulled permanently. 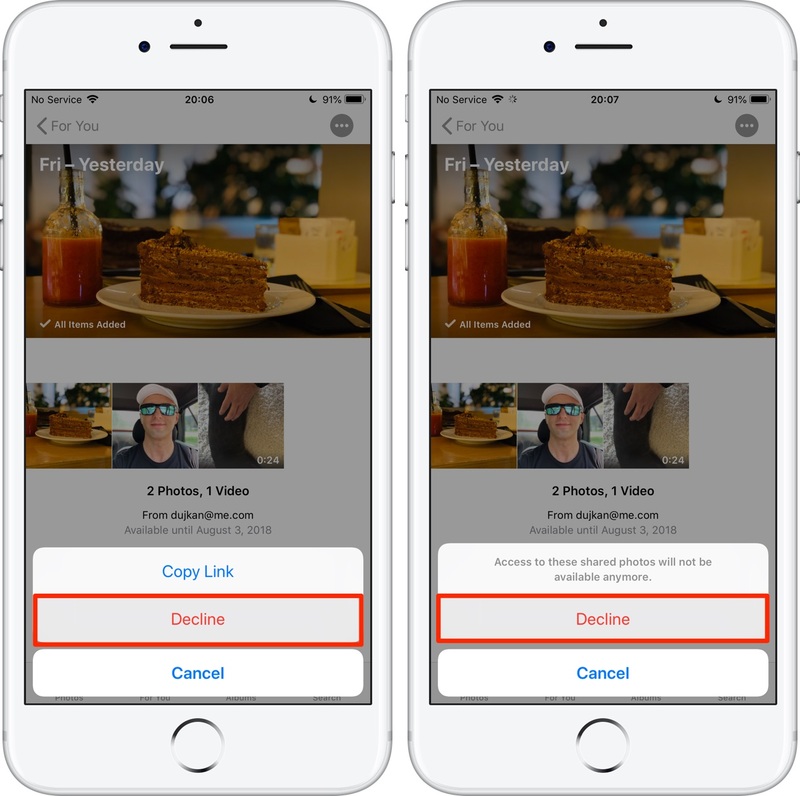 Any shared photos or videos that people with your link have chosen to download to their device shall remain in their Photos app. 2) Tap the icon labeled For You in the tab area alongside the bottom. 4) Choose Decline from the three-dotted menu in the top-right corner. 5) Confirm the operation by choosing Decline from the popup menu. “Access to these shared photos will not be available anymore,” reads the warning message. 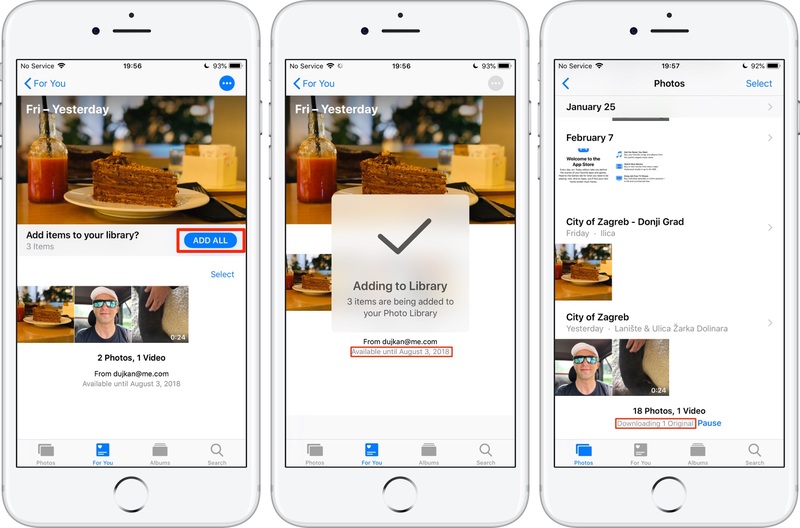 Previews of any shared photos and videos are automatically pulled from the For You tab in your Photos app. The items you’ve kept on the device won’t be removed. Wanna share the media you received through a link with other folks? Select Copy Link from the three-dotted menu to grab the original sharing link, then paste it in a message.